Many patients at home, in skilled nursing facilities, and in assisted living settings take comfort in the unconditional love offered by an animal. 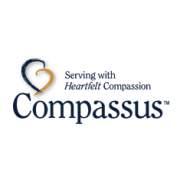 Compassus Hospice is looking for individuals who are interested in sharing their dogs with people at the end of life. We are looking for Certified Pet Therapy dogs to visit patients and bring lots of smiles. Do you have a special dog that you want to share? Give us a call at 978 777 8222 to learn how you can help. Volunteer schedules are flexible and you can volunteer as often as you wish! We are Flexible, Make your own schedule !